Holland Limousine Services is part of an International Network, in association with whom we offer privately chauffeured limousines, sedans, vans and related services in more than 420 cities Worldwide. 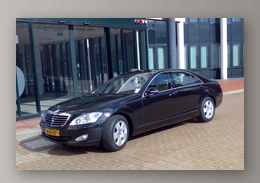 in the Netherlands we offer a modern and well equiped fleet with American as well as European built limousines, sedans and vans. Our vehicles are operated by highly trained and experienced multilingual drivers. We cater to a diverse group of clients, ranging from government officials and businessmen to artists and celebrities. Holland Limousine Services stands above the rest because we do not just provide a client with a car and a driver, but offer a total transportation service. We get to know our clients and their requirements and, based on this, handle all planning and scheduling to ensure everything goes smoothly, while still flexible for possible last minute changes or additions. This is our strength and the reason we have in the past been selected to handle all transportation requirements for large Film productions like: A bridge too far by Joseph Levine, The Word by Aaron Spelling, Cheech and Chong in Amsterdam and several smaller productions.